Dr Andrew Jones' Thursday Phone Seminar on Keeping your Pet Healthy and Extending Your Pet's Life is TONIGHT, and it's FREE. He also has 2 pet health videos you don't want to miss - now available free as part of the launch of his new pet health home study course. Take advantage of it! It's worth it! He's going to be giving AWAY 3 NEW Veterinary Secrets Revealed 2.1 Home Study Courses. to keep your dogs and cats healthy, treat them at home, and know what to do in an emergency so they make it to the vet alive! It's very LARGE, and Extremely Valuable. 2. Then go to Dr Jones' Pet Health Blog, WATCH his next 2 Frequently Asked Questions (FAQ) Videos about his New Home Study Course, and leave a Comment. I bought the original course a couple of years ago and found it invaluable. This one is even better! If nothing else, though, don't miss the free pet health care videos on Dr. Jones' blog, as they probably won't be up long after the campaign - and if possible, attend the teleseminar. At least register for a chance to win! P.S. You really do have a chance to WIN, and it's far better than the 1-in-14 million odds of winning a lottery... .Dr Jones is giving away 3 Pet Health Courses. So start by Signing Up Here! Dr. Jones is going to be giving AWAY THREE (3) NEW Veterinary Secrets Revealed 2.0 Home Study Courses. It's very LARGE and Extremely Valuable. Videos on his Pet Vet Blog, then leave a comment. You really DO have a chance to win! Want to preview some parts of the New Course? Watch the Healing Modalities Video. (and cats) will be glad you did! And be early. Dr. Jones notified his list of 20,000 - and someone else notified 500,000 dog owners. This is really big - and valuable. I'll definitely be there! Fabulous Free Pet Health Information - Did you miss this in my Paw Persuasion Pointers Newsletter? Did you see my Paw Persuasion Pointers newsletters with this incredible pet health information from Dr. Andrew Jones? These links will probably only work for a short time, as I expect this extensive FREE pet health information to be taken offline shortly (after his new course launches). So I wanted to make you you hadn't missed it. It's too vital to your dog's health! the "At Home Pet Health Exam"
(3) "The TRUTH Behind Veterinarians, Dog Vaccines, Diet and Disease" - Info in this Special Report could save your dog's life! That are TOXIC to dogs and cats. You might be surprised. There are some pretty common ones, from Grapes to Xylitol, even Apples.. and what do do IF your pet ingests ANY of these. This is vital pet health information that you WON'T find anywhere other than on these pages. Make sure you get it while it's up. Let's keep your dog healthy! BELOW is a Checklist of what to LOOK FOR and what to AVOID when evaluating DOG SUPPLEMENTS. 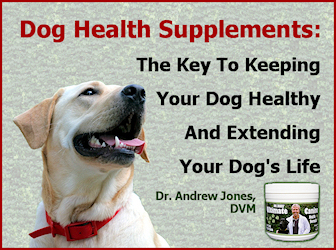 Join me as I attend my friend, Dr. Andrew Jones,' Dog Health Webinar this coming week to get my Dog Supplement questions answered... and you will also get FREE Dr. Andrew Jones' new SPECIAL REPORT on DOG FOOD & DOG SUPPLEMENTS. I wanted to get this to you as quickly as possible, so you can sign up while there is still space. Under 250 seats available as of today. and there's a Special Trial Offer for attendees. No wheat, No Soy, No Dairy, No Sugar, No Artificial Ingredients, No additives and NO fillers. 2. The ingredients should be derived from NATURAL SOURCES- If you can't pronounce them, then they probably are NOT natural. plus both naturally derived animal and plant related components. This includes ingredients such as Herbs, Mushrooms, Colostrum, Glucosamine, and Digestive enzymes. AVOID BHA, BHT and Ethoxyquin. 4. NATURAL FLAVOR & COLOR- If the supplement is chemically flavored or colored, DON'T use it! My Ultimate Canine Health Formula is all NATURAL. P.S. NOW is the time to register for the Fr**ee Online Seminar, before ALL the Spaces disappear. * Supplements: Are they REALLY necessary? * Safety: Here's how to know if supplements are safe for your dog. * Do Supplements Actually WORK? The answers revealed. * Natural Ingredients: Are natural ingredients important? You Pay For' with supplements. supplement? The importance of Third Party testing. middle aged dog need it, or is it just for senior dogs? High Quality diet, do I need to supplement as well? or will she get all she needs from her diet? AND there are now EIGHT FREE Bonuses. You should Check out the Bonuses. And I he's ADDED 1 NEVER RELEASED BONUS - The ENTIRE Cat and Dog FIRST AID SYSTEM on AUDIO. This is available to the FIRST 25 ... If you are even remotely thinking about my Course, then now is the time to ACT. Home Study Multimedia Course for $100 OFF plus the EIGHT BONUSES. This is class A, unique, invaluable pet health information. There's nothing like being an empowered pet owner. Your dog will thank you! I just received an email from Dr. Andrew Jones with this important new information on his INNER CIRCLE 2.0 MEMBERSHIP. Dr. Jones got together with his Webmaster and made a great change. This modifies what I told you in the previous post in a GOOD way. You can get EVERYTHING in his NEW Pet Health Membership Site - PLUS a huge 2-hour DVD - essentially for FREE, for ONLY the COST OF SHIPPING - Less than 10 Bucks! And you can get an ANNUAL Membership - which includes 12 CD`s or DVD`s, PLUS 12 Teleseminars, PLUS EVERY BIT of INVALUABLE Cat and Dog Health Information on his Inner Circle 2.0 - for a crazy low price. But one bonus will be gone today - The first 50 First Movers get a Consultation with Dr Andrew Jones - so look at this NOW. What we've been waiting for is here! Dr. Andrew Jones, an accomplished practicing veterinarian of 15 years, just launched his expanded, interactive, and comprehensive Inner Circle 2.0 - Pet Health and Pet Care Membership with over 2654 Holistic Cat and Dog Health Tips, Natural Remedies, and effective techniques to treat your pet at home. You can get your most burning pet health questions answered by Dr. Jones, receive his daily update Newsletter, and access all of his online products, extensive library, Q&A, Forum, and more. And now there are many additions to the already extensive Membership benefits. Trust me. You really do want to check this out! The INNER CIRCLE 2.0 is literally unique - It's the ONLY resource of its kind, and it's being updated constantly. All the latest research results and recommendations for your dog health, diagnosis and treatment of illnesses and injuries, tips for wellness, dog food to eat and dog food ingredients that are toxic, home recipes and supplements, dog vaccine research and recommended regimens, and more. New MONTHLY Members-only Benefits - You will also hear from Dr. Jones and other pet experts on the most pressing cat and dog health issues monthly via CD delivered to your home - AND - you can submit your questions and attend his monthly live, interactive Webinar! Through November 30th you can experience all that the INNER CIRCLE 2.0 has to offer for only $29.97 out-of-pocket AND get some incredible additional BONUSES (yours to keep even if you leave the Membership). So there's really no reason not to benefit from this! ACT FAST - because the first 50 purchasers also get One-on-One Consultations with Dr. Jones. Inner Circle 2.0 - Pet Health and Pet Care Membership. As for me, I am an INNER CIRCLE MEMBER. Through this clearly presented, expert advice, I have been able to stop my dog's allergic skin reactions, ensure that he has the most healthful food, understand the vaccine regimen that's best for him, and diagnose and treat some minor ailments. Should a serious dog health emergency arise, I'm prepared! Dr. Jones also provides understanding of some underlying causes of cat and dog behavior problems and how to treat them. This just might be an answer you need, in addition to dog behavior training and "dog whisper" leadership guidance. You always have to address the source of a dog behavior problem for lasting change to take place. In any event, your dog's wellness and vitality have a lot to do with his dog behavior and happiness! And he depends on you to have this knowledge to save his life and ensure his wellbeing. So become an Empowered Pet Owner on whom your dog can justly rely. Get your Inner Circle 2.0 - Pet Health and Pet Care Membership. You asked for it! In our poll on Dog Health Care Solutions on Squidoo, you told us that dog vaccines were your greatest dog health concern. And we told Dr. Jones. This dog health webinar will be focused mainly on Cat and Dog Vaccines, but will also include other hot pet health topics: Cancer, Pet Food, and Supplements. See details and sign up at The Veterinary Code Webinar. This was just announced - and in less than a day, we already have over 200 people signed up! But if you miss the free webinar, go to the link later, when the video of this pet health webinar will be for sale. His local SECOND CHANCE Animal Shelter is in crisis. So to help, Dr. Andrew Jones is holding a one week special promotion for ALL of his materials. 25% of all proceeds go to the animal shelter. Dr. Jones is offering special packages and other huge deals. For example, the eBooks have been cut to $29, and the course has been cut by over $100 to as low as $189. The special ends next Monday night - June 25th. One of my friend's dogs regularly gets ear infections. "I know that you're into dog psychology, and that's your field. And dog health care isn't. But you wouldn't have any ideas on this, would you?" I asked her how often she cleaned her dog's ears. "Any time they seem irritated," she said. I told her: "Check them weekly. You really should clean them that often ... and especially every time you bathe your dog." She took the dog care tip, and the ear infections have dramatically reduced! What's the truth about dog exercise? Exercising your dog is critical to keep him both mentally and physically balanced. It extends dog life, stimulates his appetite, and expends excess energy to calm him down. But how do you know when your dog has had enough? My Border Collie runs six miles per day with me on a bike - four miles in the morning, and two in the evening. He loves his runs. So if he indicates to me that he doesn't want to go on, I know for sure and respect the fact that he is not up to it that day. Any dog who throws a temper tantrum you should make keep going. But if the dog has clearly had enough, then stop. Some days we humans also have times when we are not fully up to snuff. Why would you expect it to be any different with your dog? It is also important to remember that not every dog can run the same distance, or at the same speed. In dog training or caring for multiple dogs, it is sometimes tempting to take a group of dogs with you at once rather than making multiple runs yourself. But that is not always wise. It is a dog health risk for some dogs if you take a pack comprised of different dog breeds and different ages out together and run them a significant distance. Not all are at the same level of physical conditioning and stamina. For example, Hounds can run 40 hours when on a significant trail. That would kill my Border Collie and many other dogs, who are not built for that. Join Dr. Andrew Jones and Catherine O'Driscoll, of Canine Health Concern, in a LIVE 60 minute Teleseminar. Catherine O'Driscoll, author of "What Vets Don't Tell You About Vaccines" will show you how to have a healthier, longer living dog. She is a recognized authority on Pet Food and Pet Vaccines. Although the cost of this teleseminar is $19.97, Dr. Jones has made special arrangements to allow you to attend at zero cost! * The Pet Food Recall- How to avoid this from happening to your dog. * The Best Food to Feed Your Dog- How to choose a quality dog food. * The Truth behind dog vaccines- What is needed to protect your pet. * How to make food for your dog- Balanced, nutritious recipes. * Vaccine side effects- What Vets don't tell you. * And much, much, much, more!!! NOTE: This Urgent Dog Health teleseminar is limited to first 250 Dog Owners who register. Registrants will be taken on a first-come, first-served basis.